The customer service is excellent, the packaging adorable, and best of all, the clothing itself arrived in perfect condition and just as described. This relatively new company is basically like shopping your favorite thrift store from the comfort of your couch, which is a really brilliant idea. My first order was a complete success. I’ve had a difficult time lately finding tees while thrifting, and since paying any more than a few dollars for a tee is not on my agenda, I was thrilled to find a really nice selection of both basic and graphic tees on ThreadUp for thrift store prices. I was especially psyched to snag this sequin pineapple tee (in my favorite color! 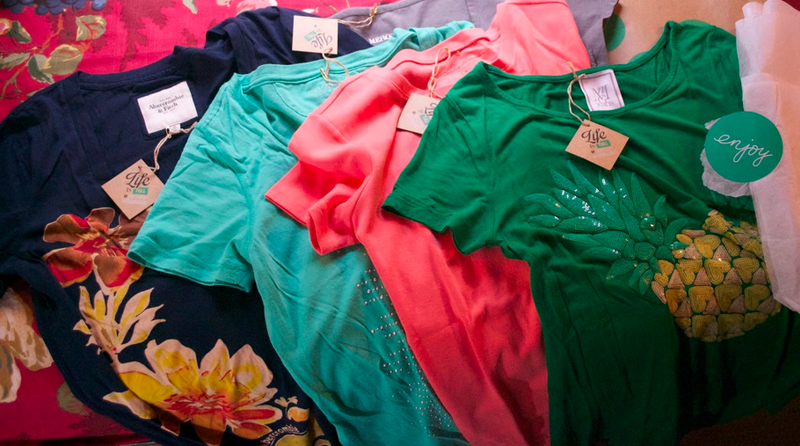 )…The customer service is excellent, the packaging adorable, and best of all, the clothing itself arrived in perfect condition and just as described. I’m so excited to be able to supplement my wardrobe with this great resource. Cardigans, dresses, blazers, accessories and more are also to be found.